WASHINGTON, DC- Throngs of demonstrators gathered to witness the raising of the flag of Cuba over the Cuban embassy, the first time it has flown in Washington here since the US broke off diplomatic relations with the communist country 54 years ago. 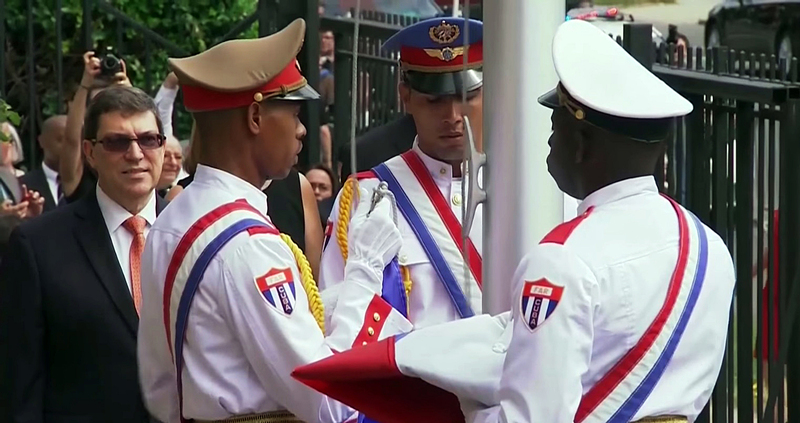 As American and Cuban diplomats stood side by side, three Cuban guards in white uniforms marched out of the building, attached the flag to a recently-constructed flag pole and raised it above Washington’s 16th Street, just three kilometres north of the White House, to mark the formal re-opening of the embassy. The move signalled the latest, and most visible, step toward normal ties between the United States and Cuba. President Obama and Cuban President Raul Castro announced in December that the two countries would end their five-decade diplomatic freeze. While the US embassy in Havana also opened on Monday, the US State Department said it won’t host a similar flag-raising ceremony in the Cuban capital until later in the year, when Secretary of State John Kerry plans to attend and oversee the event. In the meantime, the department on Monday added a Cuban flag in a hall inside its Washington headquarters along with flags from every country that has diplomatic relations with the US. 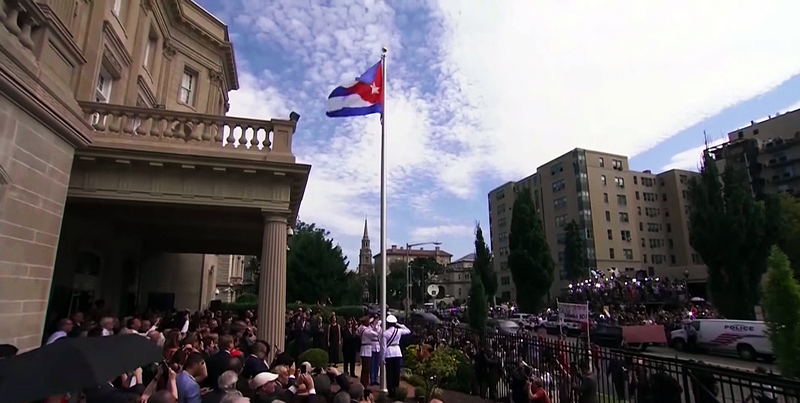 Video: Cuban Embassy Opening in Washington D.C.
Didn’t think I would see this in my lifetime!